To support, educate, and assist Eastern Montana families in everyday life and during times of need. The first fire department ball was held in Miles City in 1889, when MCFR was still called Daniel’s Fire Company. Over the years, it became one of the premier social gatherings for the community. As time progressed, the department wanted to do more for the community and subsequently started a program to distribute free bikes to community children in the early 1970’s, using profits gathered from admission fees to the Fireman’s Ball. By the late 1980’s, with the demand for bikes in the community reduced, the department began participation in the local Empty Stockings program, donating toys and funds for community residents. 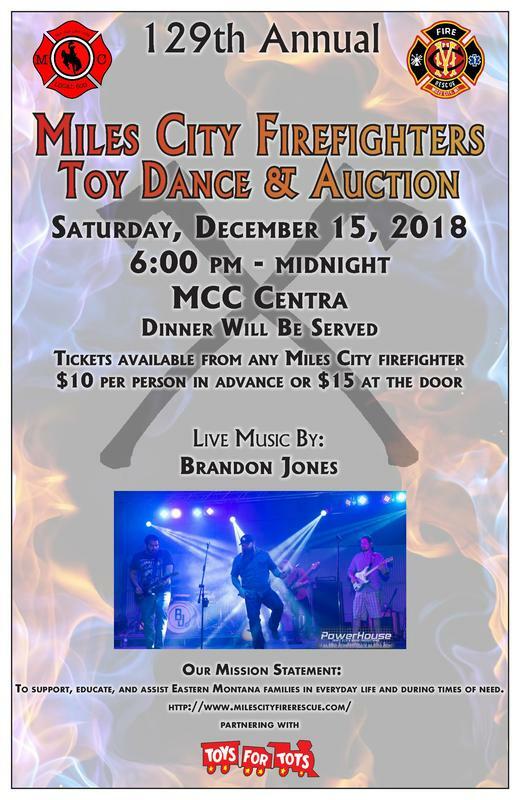 Soon after, the Fireman’s Ball was renamed the Miles City Firefighters Toy Dance and Auction and the program has continued to grow in leaps and bounds since that time. Not only does the Toy Dance provide large numbers of toys to residents through the Empty Stockings program, but also via the Montana Department of Public Health and Human Services, local Office of Public Assistance, and Eastern Montana Community Mental Health. In 2012, MCFR was approached by the Veterans of Foreign Wars and the American Legion to apply to administer a local Marine Corps Toys for Tots program. This partnership rapidly expanded the local toy donation program, allowing for toys for over 400 local children, 150 disabled adults, and residents of several surrounding counties. With the support of the community, the program will continue to grow as we seek to ensure that everyone will always receive a little holiday cheer.